Yesterday, I had lunch with Diane Bryant. Until January, she had been CIO at chipmaker Intel. Then, on Jan. 20, as part of a management shake-up, she was named vice president and general manager of Intel’s Data Center and Connected Systems Group. 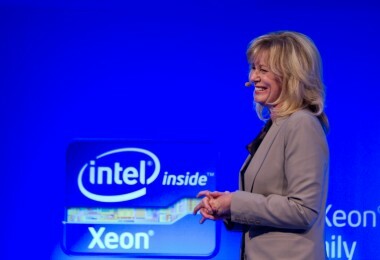 She was in New York yesterday for a lunch with a few journalists, primarily to talk about Intel’s latest generation of Xeon processors for servers. Before they were officially released, these chips were known primarily by their code name, Romley, and often still are when analysts and others talk about them, because the code names are easier to remember than the product names, which, for the record in this case, is Xeon Processor E5-2600. The Romley generation of chips builds on the foundation of Intel’s previous generation of server chips, known by its code name, Nehalem. The main benefit, which Bryant and other Intel execs and customers explain in lengthy detail in this video from the product’s launch in San Francisco three weeks ago, is that the chip is 80 percent faster at certain computing jobs, according to independent tests. At the same time, it is 50 percent more energy efficient. Executives who operate data centers generally worry about two things: The raw number-crunching power they can squeeze out of the chips in their densely packed racks of servers, and the cost of the power required to keep them running and also keep them cool. So the introduction of a chip that can get more work done in a shorter amount of time while using half as much power is, at first glance, a pretty compelling moment to consider an upgrade. And yet, that doesn’t seem to be the case. In a survey of 100 CIOs of large enterprises conducted by the investment bank J.P. Morgan, 91 said that they didn’t see Intel’s Romley chips as much of a catalyst for upgrades in their data center. Most seemed happy with the Nehalem-generation chips they had just purchased in servers during the past two to four years. I was eager to share this result with Bryant to see what she said, and was too rude to wait until the salad course had arrived. For a moment, she was surprised — 91 percent is a pretty large percentage, after all. But the surprise didn’t last more than a few seconds. Off the top of her head, Bryant rattled off the following, which I’m paraphrasing. On a recent visit with a customer who happens to be one of the 100 largest companies in the world — she wasn’t at liberty to identify it — Intel found an interesting result. A check of the company’s data centers found that 36 percent — a little more than a third — of its servers were using chips that were more than four years old, meaning that they dated back to the dim mists of the days before Nehalem. Those servers, it turned out, were responsible for consuming 65 percent — nearly two thirds — of its power supply. And how much computing muscle was the company getting for all this power? Precious little: The servers in question provided only 4 percent of the computing power of its infrastructure. To sum up: A third of the data center footprint was eating up two-thirds of the power budget, but providing less than one-twentieth of the overall computing capacity. Those older chips just aren’t pulling their weight. “This is is extremely typical of what we’re seeing,” Bryant told me. Even so, she conceded that a customer running a larger percentage of more-recent chips — Nehalem and its newer variants — in its infrastructure might not see the sufficient bang for the buck of an upgrade that anyone running a lot of servers with older chips probably would. I have to admit it was a pretty good answer.